Cultivating gratitude in all aspects of our lives leads to improved health, relationships, success in our endeavors, and overall fulfillment. But how do we feel it when things are difficult? Is it possible to feel grateful for the unexpected, for adversity, for the dualities of gain and loss, pleasure and pain, success and failure? With practice and an adjustment of our outlook, we can proceed on this dynamic path of Bhakti Yoga that enables us to appreciate everything we encounter in life, with a positive and progressive outlook, as coming for our ultimate benefit. 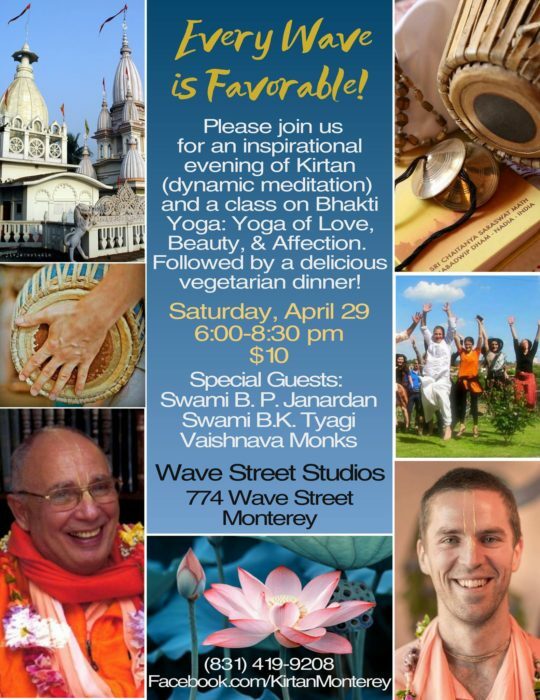 Join us for an evening of thought provoking discussion accompanied by kirtan* and a vegetarian dinner led by Srila Bhakti Pavan Janardan Maharaj, a spiritual leader and community builder based locally in the Monterey Bay area. *Kirtan: We will be singing and chanting devotional songs from West Bengal, India. In this case it will be in the call-and-response style where everyone is encouraged to participate, using the traditional instruments, Mrdanga drum and karatals. In this practice kirtan is a form of meditation and devotional practice, rather than a performance.